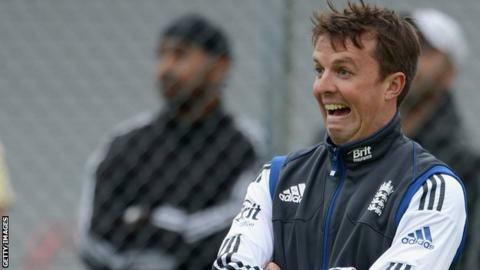 England spinner Graeme Swann has signed a new deal at Nottinghamshire which keeps him at the club until 2014. The 33-year-old will remain centrally contracted to England with his two-year Notts contract only becoming relevant if he loses his international status. Swann said: "Trent Bridge is the best ground in the country. I want to spend the rest of my playing days here." "He is great to have around for both cricket and comedy value," director of cricket Mick Newell added. "It's pleasing that he has committed his future but I fully expect him to remain a key part of England's plans for the foreseeable future." Newell, who signed Swann in 2005, added: "Graeme has excelled at the club and it was always evident that he had the potential to become a consistent international cricketer. "But he has surpassed everyone's expectations with his achievements since his Test debut." Swann has taken 188 wickets in 44 Tests for England, with 95 dismissals in 69 one-day internationals.